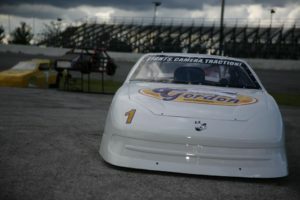 MiniCup racecars are a nationally recognized class, that offer a fully caged, fully suspended NASCAR style chassis, powered by an affordable Honda 400cc engine. GMS chose this entry level racer as our driver development platform, because of it’s safety, adjustability and simplicity. A great entry level class, and often an appropriate step up from Karts, because of the adjustable chassis. As basic as these cars are, a driver that fully understands how to properly tune a MiniCup, will have the ability to communicate effectively with professional crew chiefs anywhere. If you ready to purchase a MiniCup, GMS has new cars available for immediate delivery. Easy to maintain, economical and Eco friendly as they use less than a quart of oil, and can practice, qualify and race on about a gallon of regular pump gasoline.Small enough to fit in a back of a pickup truck…no trailer needed! Weight. 700 Lbs with driver and fuel. Engine. 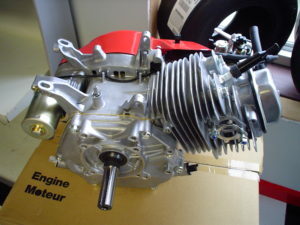 Single cylinder, air cooled, 4 stroke Honda. A stock engine can be purchased at your local Harbor Freight for about $300. Transmission. Chain drive, centrifugal clutch. Suspension. 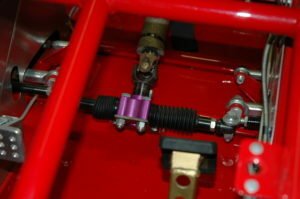 Fully suspended with coil-over shocks. Safety Features. 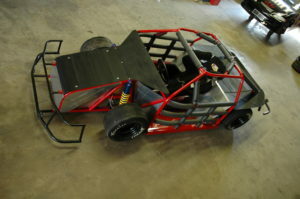 Full roll cage, aluminum racing seat, five point harness system, fire suppression system. Speed. With enough strait-away, they are capable of 100+ MPH, they’re usually within 1/2 second of a Super Late Model at a typical short track . . . Unbelievable, but true! Clean, NASCAR style bodies are very appealing to sponsors.